JALBCA presented its Nineteenth Annual Ellen P. Hermanson Memorial Symposium on October 6, 2014. 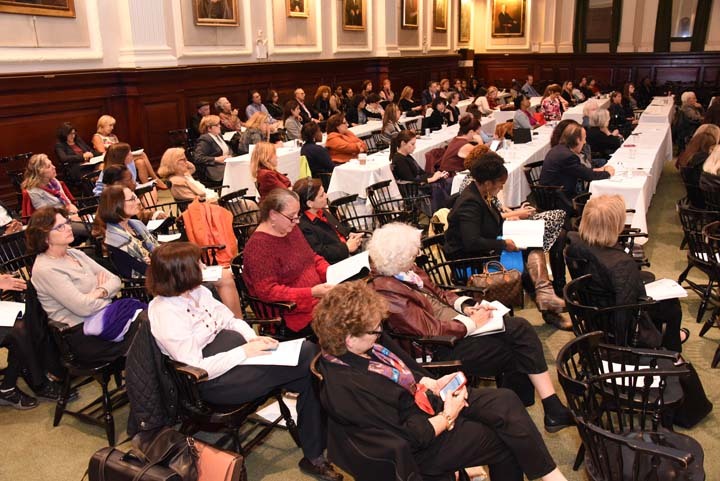 The program, “Off-Label Treatment: Use of Cancer Drugs Outside of Conventional Trials and Government Approvals”, was presented at the New York City Bar Association, and the Women’s Bar Association of the State of New York served as the CLE provider. 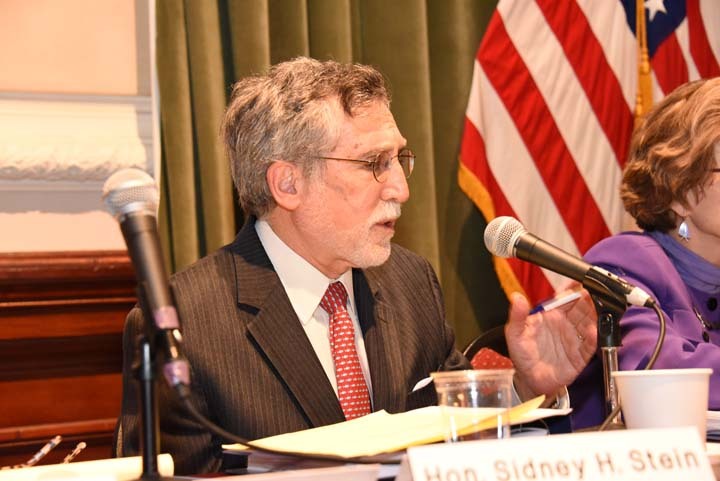 We were fortunate to have former JALBCA Co-President Edward Kornreich, a healthcare Partner at Proskauer Rose LLP, serve as Moderator of the program, and we were honored to have a panel of judges comprised of Hon. Helen Freedman, NYS, Appellate Division, First Department (a former JALBCA Co-President), Hon. Sondra M. Miller, Chief Counsel, McCarthy Fingar, LLP (a former JALBCA Co-President), and Hon. Sidney H. Stein, US District Court, S.D.N.Y. They were joined by a panel of experts in the subject area that was comprised of Kathleen M. Boozang, Associate Dean and Professor, Seton Hall University School of Law, James F. Murdica, Partner, Patterson Belknap Webb & Tyler LLP, Larry Norton, MD, Deputy Physician-in-Chief for Breast Cancer Programs, MSKCC, and Catherine M. Sharkey, Professor, New York University School of Law. Once again, former Co-Presidents Hon. Shirley Kornreich, Martha Golar and Barbara Ryan, assisted by JALBCA intern Samantha Kopf, served as the Symposium Co-Chairs. The 2014 JALBCA Symposium focused on how doctors, insurers and government make decisions concerning off-label use of drugs, particularly in cancer care, and how the regulatory model for clinical trials interacts with off-label therapy. A “drug label” is enclosed with a Food and Drug Administration (FDA) approved drug and contains information about the drug, including the dose and how it is to be given to treat the particular medical condition for which it was approved. When a drug is used off-label, it is used for a disease or indication for which it was not approved by the FDA; given at a dose or frequency other than the one for which it was approved; or given to treat a child when the product was approved by the FDA for adults. It has long been recognized that physicians have autonomy and professional discretion in the practice of medicine, including the right to prescribe a drug for purposes other than FDA-approved uses. Thus, a drug recognized by the FDA may be prescribed by a physician for another purpose when, in his/her judgment, such use is indicated and the relative risks are appreciated (disclosed to the patient and the patient’s consent is obtained). The literature suggests that 70% of drug use in cancer is on-label and 30% is off-label and more than half of the 30% are in recognized compendia. “Good medical practice and the best interests of the patient require that physicians use legally available drugs, biologics and devices according to their best knowledge and judgment. If physicians use a product for an indication not in the approved labeling, they have the responsibility to be well informed about the product, to base its use on firm scientific rationale and on sound medical evidence, and to maintain records of the product’s use and effects. Use of a marketed product in this manner when the intent is the ‘practice of medicine’ does not require the submission of an Investigational New Drug Application (IND), Investigational Device Exemption (IDE) or review by an Institutional Review Board (IRB). However, the institution at which the product will be used may, under its own authority, require IRB review or other institutional oversight.” (Emphasis added). Since off-label drug use (conventional chemotherapy, as well as targeted therapies) for cancer has developed outside the realm of clinical trials, it is important to discuss why this occurs and whether there are standards and practices that, in the absence of FDA approvals and clinical trial results, assure drug safety and efficacy. Examples of targeted therapies include the following: small molecular inhibitors, monoclonal antibodies and conjugated agents (e.g., a combination drug and biological delivery medium, such as a microbe). Off-label use was enough of a concern to the Center for Medicare and Medicaid Services (CMS) that several years ago, its coverage analysis group commissioned a report through the Agency for Healthcare Research and Quality (AHRQ). The result was a 2010 report, entitled “Report on the Evidence Regarding Off-Label Indications for Targeted Therapies used in Cancer Treatment”. Investigators found that, at best, it appears that the available exchange of information (through compendia, etc.) is to warn of toxic effects rather than to advise practitioners and the public about the efficacy of treatment. While the AHRQ report acknowledged the rapid pace of data and the promise of targeted therapies, it essentially warned that the body of knowledge for clinicians and patients is quite limited. The program began, as it always does, with a progress report by Dr. Norton describing the latest developments in cancer treatment. He indicated that research with targeted therapies is “at the end of the beginning” and some of the drugs from the last couple of years are showing validity (e.g., Tratuzinab; CDK4/6 inhibitors such as Palbociclib; Affinitor). He noted, however, that the drugs are combined when used, thus, used off-label. Indeed, there is good data to demonstrate the efficacy of many off-label uses, including unapproved schedules, but insurers often will not pay for such uses. Similarly, good studies may not lead to good drugs if the study is published because drug companies then will not develop it, since a patent is no longer possible and money cannot be made. Dr. Norton further noted that immunotherapy is coming of age. He warned that just stimulating immune response is not good since this could help the cancer grow. Understanding the biology is important. He told us that, in the coming months, there will be disclosure of an important discovery concerning the biology of how white blood cells may help to cause cancer growth. Dr. Norton warned of unintended consequences. One of the consequences of the United States Supreme Court’s ruling in the Myriad case (involving the patentability of genetic tests for the BRCA 1 and 2 genes) has been the unleashing of many companies who have appeared in this lucrative field. Myriad, however, has not released its many years of data, which it considers proprietary, but which may be necessary in understanding the test results. Other gene-testing companies test more than the BRCA genes, advertise their gene tests to the public and report abnormalities. Regrettably, often, the testers do not know what the test results mean, and the recipient does not necessarily know what to do with the newfound information. Finally, Dr. Norton suggested that the medical profession is increasingly moving in the direction of rule compliance and away from caring and compassion. Moreover, what appears logical and rational often cannot be done due to rules imposed by the system. Judge Miller opened the program by asking whether the public is being poorly served by the failure of the system to provide clinical trials for off-label uses of drugs. Professor Boozang responded that pharmaceutical companies are incentivized to pursue clinical trials for the most narrow implications and to use endpoints that can be reached most expeditiously (i.e., less expensively) because, once a drug is patented, the clock is ticking on the patent. Clinical trials take time and are very costly. Further, once an off-label use becomes the standard care, there is no incentive for a company to conduct clinical trials for other uses as this would benefit the generics. Also, further trials might uncover risks associated with the drug or show the drug is not effective. James Murdica added that, in his practice, the FDA has sometimes granted patent extensions so that companies can study an off-label use. Moreover, he noted that companies collect data on off-label use and although they cannot market drugs for such use, a doctor can call the company and find out what the data shows. Ed Kornreich asked the panel whether the FDA requires manufacturers to collect data on off-label uses. Professor Boozang noted that, as information becomes known, the FDA can impose risk mitigation strategies, requiring the company to notify doctors of adverse consequences. Professor Sharkey remarked on the paradox whereby the FDA has strict controls for providing safety/efficacy prior to drug marketing but thereafter does not want to interfere with doctors’ practices. Finally, Dr. Norton stated that doctors are restricted in their use of drugs on both reimbursement and guidance levels. The payor controls the marketplace. He again emphasized that most of oncology practice is off-label because drugs are used in combination. Professor Boozang remarked that in cancer care and with children, off-label use is common. Dr. Norton added that anti-inflammatories are very important in treatment, yet there are no clinical trials because the market for anti-inflammatories is far beyond cancer treatment and any adverse results would negatively impact the pharmaceutical market. The panelists discussed the compendia which providers refer to in off-label treatment. Ed Kornreich indicated that there are four such compendia and insurers will reimburse if a drug is listed in one of them. Professor Boozang advised that the information in the compendia is gathered in different ways – for example, it can be solicited from pharmaceutical companies, it can be taken from clinical practice guidelines or compendia staff may conduct its own research. Staff research was greatly criticized for a period of time for conflict of interest reasons, because of a close relationship to, and compensation received from, the industry. She also referenced the conflicts of interest among doctors who put together clinical practice guidelines. Dr. Norton assured us that that the Network of Cancer Centers compendium, with which he is most familiar, requires evidence-based (not opinion-based) data based on clinical trials that are peer-reviewed; further, that clinical trials have data safety monitors who are people whose names are not on the research paper and who are not part of the clinical trial, and that usually the information is based on two ( not one) unrelated trials. He would be concerned if compendia are replaced in the future with “big data” compiled from data-mined, anonymized patient records because of the absence of the use of appropriate medical judgment and interpretation of this raw data. Judge Stein questioned how efficacy is determined with off-label drugs. Dr. Norton stated that standard of care for off-label use is based on good publications and literature. It is evidence driven. Professor Boozang mentioned that there is a lot of information to support the fact that in many areas of the country the primary source of information to providers comes from pharmaceutical representatives and medical conferences and the primary source of education for the patient is from the internet. Noone suggested a mechanism to assure efficacy of off-label use. Dr. Norton reminded the audience that, in the clinical trial context, replication of trial results is the way to assure their validity (regardless of whether a clinical trial is financed by the pharmaceutical industry or some other source). He suggested that peer pressure among doctors and an educated patient and public are the methods for assuring appropriate off-label use of drugs. Mr. Murdica noted that many Scandinavian countries collect electronic medical data for observational studies. Dr. Norton felt this was not a good method unless one started with an hypothesis and conducted randomized, clinical trials that could be repeated to show the efficacy of the results. Unfortunately, the federal government has reduced the money available for trials. Consequently, the pharmaceutical companies conduct drug trials. As for the promotion of drugs for off-label use by pharmaceutical companies (which was the topic of a prior year’s JALBCA Annual Symposium), this is illegal, although legal defenses have been raised about the constitutional, First Amendment right to make accurate statements regarding a drug. The Department of Justice relies on the False Claims Act to bring actions against pharmaceutical companies which market off-label drugs, arguing that such marketing causes Medicaid and Medicare to incur costs inappropriately. The panel next discussed international practices of off-label use. There is concern that economic constraints will ultimately drive medical decisions. The Italian legislature, in June 2014, and the French legislature, in July 2014, passed laws permitting certain listed medications to be used off-label, even though an alternative authorized drug was available, because the approved drug was so expensive. Professor Boozang stated that in Italy and England, for example, the pharma companies which manufacture the authorized drug are fighting reimbursement for off-label use, though these same companies support such use in the United States. The Symposium ended with a period for questions from the audience. The CMS will be releasing details of payments to doctors by every pharmaceutical and medical device manufacturer in the country. CMS calls this the Open Payments Program. The agency is charged with implementing the Physician Payments Sunshine Act, which was initially introduced in 2007, and mandates that manufacturers of drugs, devices and biological and medical supplies covered by federal health care programs collect and track all financial relationships with physicians and medical school teaching hospitals. The Act became part of the 2010 Affordable Care Act. The objective was to enhance patient safety by increasing the transparency of financial relationships between health care providers and manufacturers, thus exposing potential conflicts of interest. Based on these disclosures, people may question whether their doctors and hospitals have motives other than patients’ best interests when they choose one drug or medical device over another. Once CMS collects the reported financial data it will report the information publicly on a website. The website was launched on September 30, 2014. The companies must disclose payments made for things like promotional speaking, consulting, meals, educational items and research. Reports on 2013 data were released to the public September 30, 2014 and are available at cms.gov/openpayments. This first report, covering only a five month period, revealed that drug and device makers made 4.4 million payments to 546,000 doctors and more than 1,300 teaching hospitals from August through December 2013. In total, the payments were worth about $3.5 billion. The first full-year accounting of payments is not expected to be released until June 2015. ProPublica, a nonprofit journalism organization, maintains its own database of health care company payments to medical providers as part of its Dollars for Docs project. At the JALBCA Annual Symposium (see above), one panelist reported that the role of pharma sales representatives – who have direct relationships with providers – is changing, implying that their role in providing compensation to providers would decrease. Several reasons were cited. First, future target consumers would be big entities, and not individual doctors, as the purchasing decisions are increasingly made by formularies, hospital committees, Medicaid, Medicare and insurance companies. Second, companies see that they are not getting their return-on-investment from the physicians and are re-allocating their resources. Third, at least in Europe, there is a significant debate about whether they can remove the pharma industry from the practice of paying for continuing medical education for doctors. Also, once a company loses patent protection on a drug, there is less reason to incur these expenses. 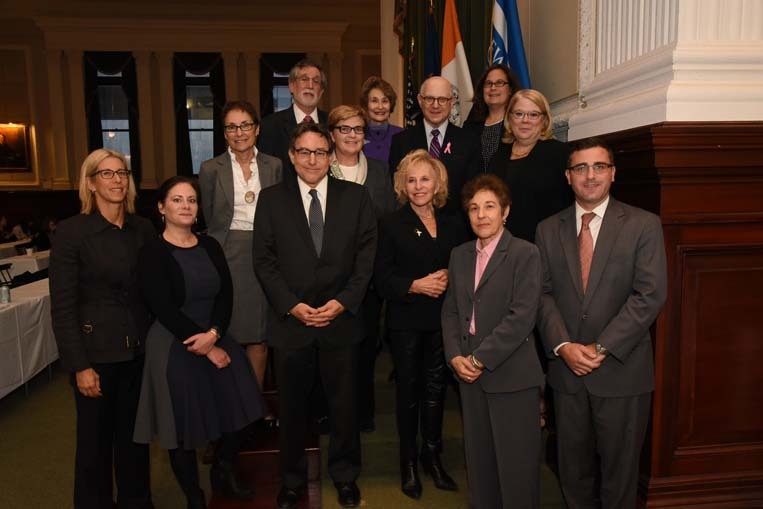 On October 30, officers, directors and members of the Brooklyn Women’s Bar Association and JALBCA gathered at Brooklyn Borough Hall to receive a citation from Hon. Eric L. Adams, Brooklyn Borough President. 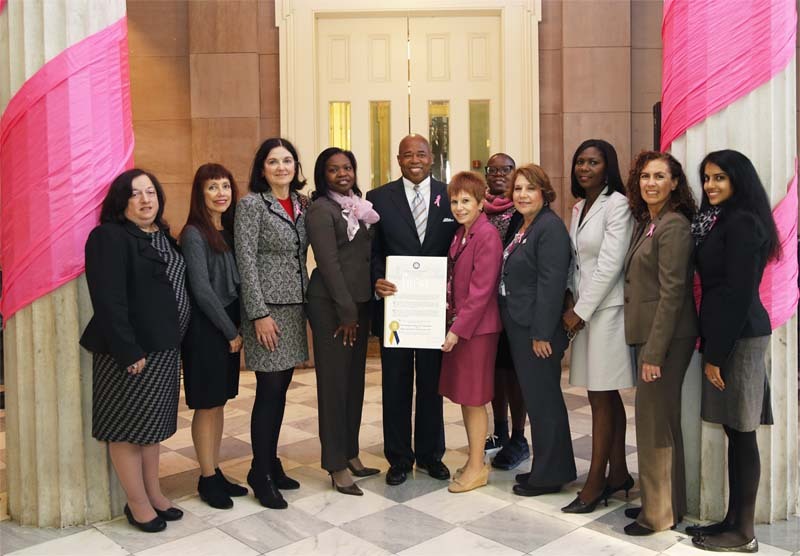 Having proclaimed October as “Breast Cancer Awareness Month”, Hon. Eric L. Adams acknowledged and commended the groups’ efforts “to focus the attention of the public and our policymakers on breast cancer awareness and the need for more research, preventive measures, treatment options, and a cure for this devastating disease.” The event exuded the passion involved in the commitment to the cause. Left to Right: Joanne Minsky Cohen, Esq., Vice President BWBA, Co-Chair October Alert; Hon. Margarita Lopez Torres, Surrogate-Kings County; Barbara Grcevic, Esq., Board Member BWBA; Hon. Genine D. Edwards, AJSC, BWBA Board Member; Brooklyn Borough President Eric L. Adams; Hon. Marsha L. Steinhardt, JSC, President BWBA; Hon. Robin Sheares, JCC, BWBA Member; Hon. Ellen M. Spodek, JSC, BWBA Vice President, JALBCA Past President; Derefim B. Neckles, Esq., Court Attorney Referee, BWBA Board Member; Consuelo Mallafre, Esq., BWBA Member; Silpa Ramineni, Esq.